Vaping came out as an easy way to quit smoking. Many people were able to stop their terrible habit by phasing out the amount of nicotine they were inhaling. This was how the vaping illusion began. Now vaping is more popular than smoking ever thought of being. There is something cool about being about to blow giant puffs of smoke from a car. Another upside is the smell vaping puts off. Opposite of the stinky old cigarette smoke, vaping comes in flavors. The new taste, the increase in smoke volume to expel, is make vaping very cool among teens today. The graph below from the Nation Institute on Drug Abuse indicates that marijuana is 3 times more popular than cigarette smoking. Could it be the dramatic increase in vaping among high school students is hiding something much more troublesome? Is it harder to detect when someone is using Marijuana in the vape pipe? In fact, it is more difficult to detect marijuana contained in a small vape device. The pot is heated with batteries and makes it easier to inhale the toxic substance. It is also difficult to know how potent the hit they are taking really is. Since Marijuana is being legalized in so many states, is there a ripple down effect that is creating an increase in use among our teens? In most cases the laws are still too new to determine what the consequences will be. It stands to reason however, that an increase in availability for adults will trickle down to availability in teens. 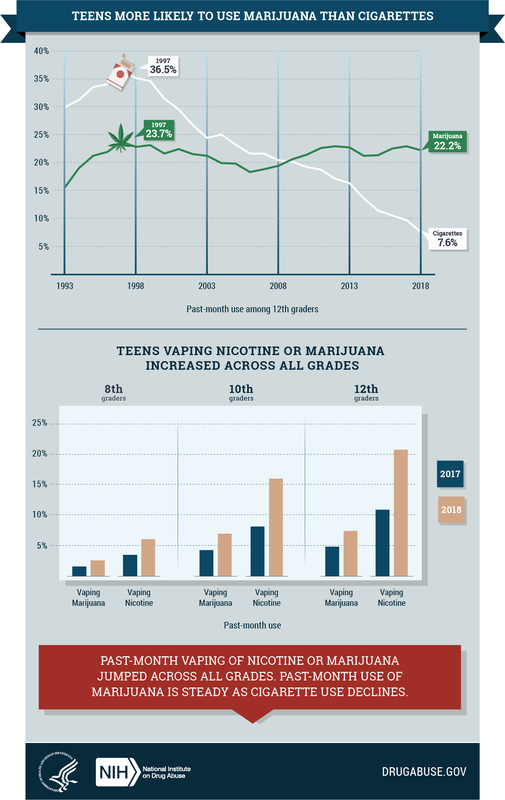 The chart above makes it difficult to deny the increase in vape usage among high schoolers. The most dramatic increase is in 11th and 12th graders. The most unfortunate unknown piece of this statistic is how many of these users are sneaking a little pot in their pipe? How Does Marijuana Affect My Teen? As previously mentioned, the effects of Marijuana on teens is hard to quantify. It I widely believed that pot smoking teens may be causing permanent damage to their brain as it is developing. Some studies have shown that teens who use marijuana are forcing their brains to work harder than non pot smoking teens. This is due in part to the fact that the brain needs to work harder to respond accurately. This can be known as increased brain activity. Increased anything seems to sound like a good thing. That is not so in this example. The brain is having to be more active to accomplish tasks that are not that difficult. The obvious benefit for a teen that smokes pot is to escape reality and deal with life. Can pot smoking be a pre curser for a teen that will later on be diagnosed with Psychosis? Is the teen simply self medicating to deal with psychosis, or does pot smoking actually lead to psychosis? Some studies have shown that teens who smoke pot are 60% less likely to finish high school or get a college degree. It is a myth that smoking pot is not habit forming. Some studies indicate that marijuana smoking teens have about an 18% times greater risk of becoming dependent on pot smoking.